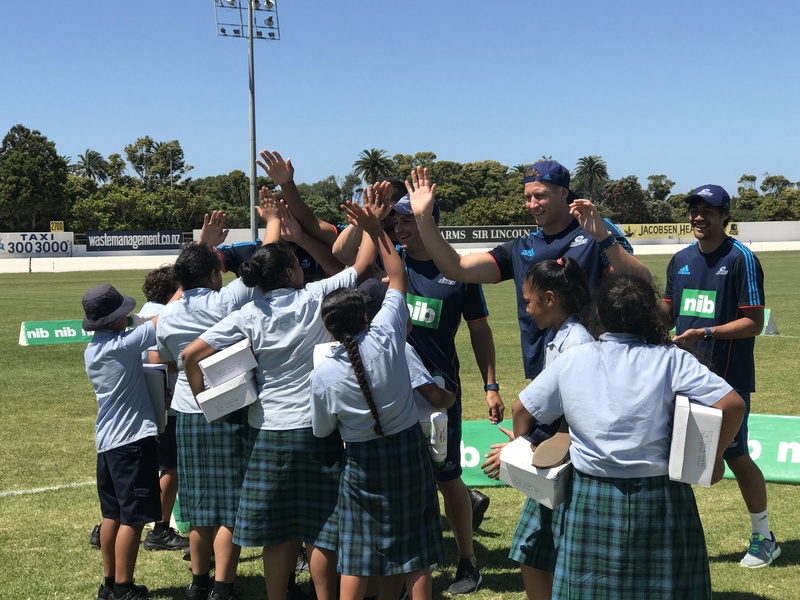 We've helped a group of 15 children from KidsCan partner school, St Joseph's Catholic Primary School in Grey Lynn, join some of their Blues heroes at an afternoon training session today. Proud supporters of KidsCan, we were able to make the opportunity for the kids to meet some of their favourite rugby players possible thanks to our principal partnership with the Blues. During the exclusive afternoon session, the children enjoyed some snacks while having a chat with Melani Nanai, Jimmy Tupou, Alex Hodgman, Scott Scrafton and Michael Collins, before heading out onto the field for a skills and drills-style session. Our General Manager Direct and Partnerships, Ben Rose said nib was proud to be able to bring smiles to the faces of the students through the money-can't-buy experience. "We are committed to helping New Zealand families not only with their healthcare needs but also to enjoy their every day lives. Our support of amazing charities like KidsCan reflects this committment and we're excited to provide these kids with an experience they will never forget." KidsCan CEO, Julie Chapman, says the charity is all about enriching Kiwi kids' lives by giving them a hand-up with the basics so they can participate at school. "It's also about removing barriers so they can just enjoy being a child and the afternoon with the Blues shows how inspiring and motivating joining with like-minded caring organisations can be." "What a wonderful opportunity today for this talented bunch of St Joseph's. It's not every day you get to train with some of your favourite ruby stars. We're thankful to nib and the Blues for making this happen." We've also supported KidsCan through our latest sales campaign which sees customers who join any combined hospital + everyday cover by 17 Jan 2018 recieve not only a $100 Prezzy card for themselves, but nib will also donate $100 to KidsCan to go towards the basics like raincoats, shoes and food items. "With the support of nib and their customers we'll be able to help more of the thousands children who every day go without in New Zealand. That is a pretty special way to round out what has already been a busy year after recently reaching a record 700 schools receiving KidsCan help." "However, there are now 19 schools on our waiting list, those schools are full of young children waiting for help that will make a positive difference in their lives. $15 a month is all it takes to become a monthly supporter and help a Kiwi kid make the most of their education, so they can reach their full potential, and maybe even turn out to be a Blues player," says Julie Chapman. Learn more about our partnership with KidsCan here.